Site Updates / Design Article #3: What is a Pony? This is my take on a write-in card for TSSSF. I've modified the format to make it more conducive to handwriting/hand-drawing. Here is the bleed file so you can print your own for personal AND commercial use. That’s right; you may print and sell this card. Also, if you come up with anything good, be sure to post it below (keeping in mind this site's PG-13 rating). This is the name of your character. If it's different than the name most people would know them as, add their usual name as a keyword. Male, female, both, or none (leave blank). There are 4 in-game races: Alicorn, Earth Pony, Pegasus, and Unicorn. Non-pony characters are assigned to one of these races based on whether they have horns and/or wings, and their actual race is added as a keyword. If the character does not resemble a living creature, you may leave this symbol blank (such characters usually get the Object keyword). This denotes that the character is from an alternate timeline. The most common alternate timeline is the Dystopian Future (hourglass). Your character should be the focus of this art. Also, be sure to get the artist to sign their work. If there are any keywords (Princess, OC, Mascot, etc.) that would help this card count toward existing Goals, add them here. For a list of the most commonly used keywords, please refer to Section 7 in the TSSSF Style Guide. Note: Keywords, including name keywords and racial keywords, should be arranged alphabetically. 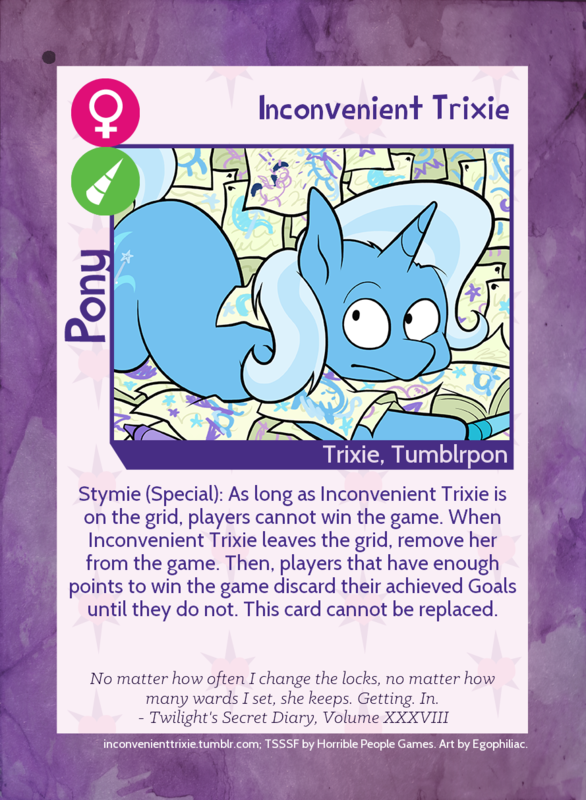 If there is something the player should know about this card, such as the number of Ponies it counts as, put that text here. The power name is used to explain why the power makes sense for your character. To save space, the 6 standard Pony powers are listed here for you to choose from (If you don’t know what they do, please refer to 2.6.3-2.6.8. in the TSSSF Style Guide). “Special” has been omitted for two reasons. The first is the amount of space it would take to write out. 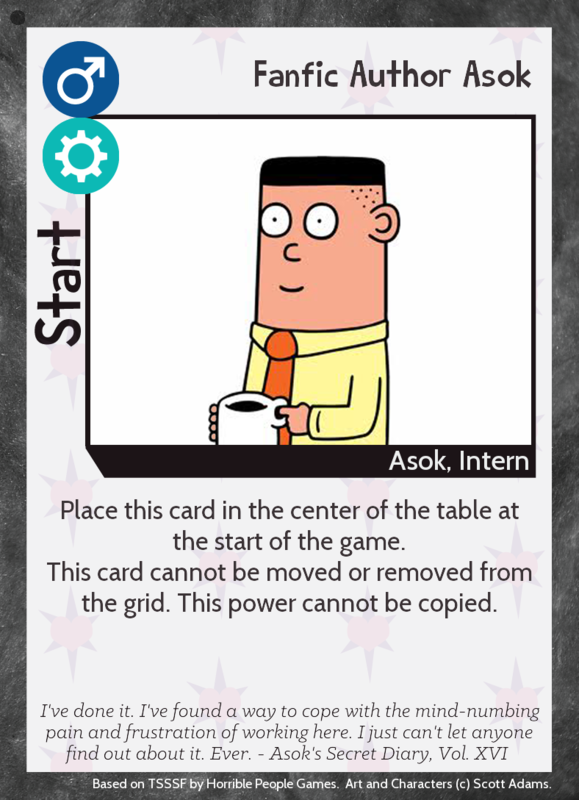 The second is that Special powers require some trial and error to get right, so by using a standard power you are guaranteed a playable card, which is especially important if you already paid for an art commission. Ever wish you could ship Wally with the Pointy-Haired Boss? Or Alice with her even-tempered doppelganger from another dimension? You can, in Asok's Secret Shipfic Folder! Are there any cards you've played with, and had to remove from your deck, or fix by adding house rules? I've found that the one-activation-per-turn rule suggested by HPG solves a lot of problems (like Freedom Fighter Pinkie and Cheerilee). At first I was skeptical that it would be too restrictive, but then I remembered that "the specific overrides the general," so cards that say a card's power would activate (most notably Love Poisons) still work, which allows for some fun combos. Even still, I've found some cards to be too powerful or otherwise make the game less fun*. Some men just want to watch the world burn, and when one of them is in your playgroup, you can’t play with Wildfire. I’ve talked before about the importance of slicers**, but this card just makes it too easy to remove large portions of the grid. 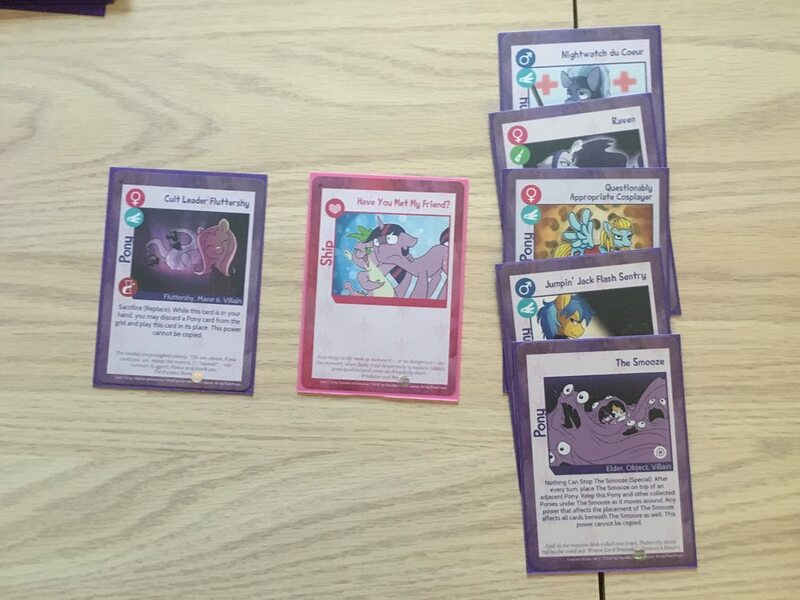 Pinkamena’s effect is at least limited to the ships touching the Pony card she caused to be discarded, but Wildfire can cause up to 3 Pony cards to be discarded, which could directly affect up to 10 ships, or affect ships in unrelated parts of the grid. Also, her power is single-purpose***, as opposed to Love Poisons, which can be used to activate Pony powers. 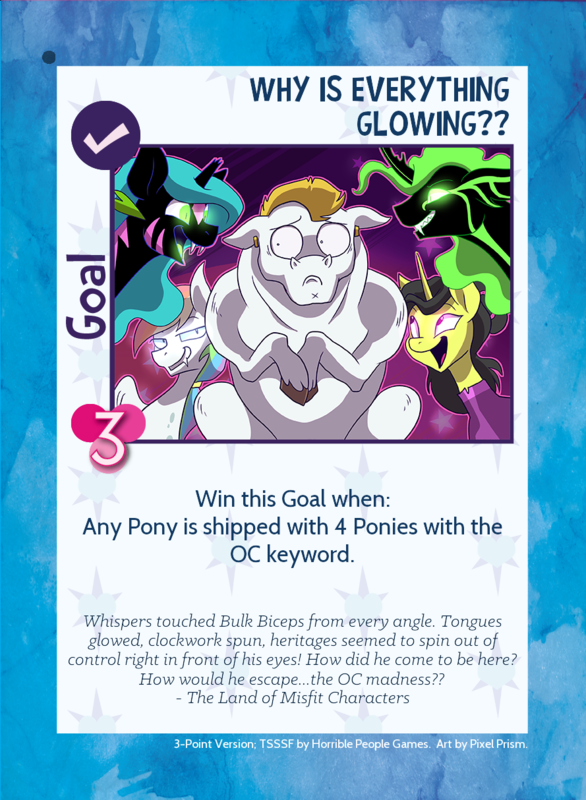 There are a bunch of Goals that require playing a certain number of Ponies or making/breaking a certain number of ships, and this card makes them trivial to achieve, especially when you consider race/keyword/timeline-change ships. (I once playtested a card that counted as 3 Ponies, and it had the same problem. 2 Ponies seems to be the limit). I once played a very long game where this card was used a lot. I suspect that activating this card’s power sapped the players of the resources they needed for the newly revealed Goals, but I need more data to confirm this. In the meantime, this card is sidelined. *What constitutes a “fun” varies widely from player to player and group to group. **cards that have powers which can cause Ship cards to be removed from the grid. The nickname comes from Aria’s power in the No-Holds-Barred expansion. My friend Eddie recently remarked that there should be "style points" in TSSSF. I think one of the strengths of TSSSF is that players can ship whomever they please without consequence, but there is a certain satisfaction in playing a popular ship. So I got to thinking, how would you assign style points? Would players vote? Then I recalled that games where best pairings are chosen, like Cards Against Humanity, have a judge. Also, that Twitter post made me think a random ship generator might be pretty cool. This thought was inspired by the Cyanide and Happiness random comic generator, which was then developed into the game Joking Hazard. It was then that I realized TSSSF cards could be used for a similar style of game. WARNING: I haven't playtested this very much, and it might not be very fun, which is why I posted it here in the Drawing Board. It is, however, interesting from a game design perspective. Materials: Pony and Ship cards only. Ignore all card rules. Shuffle the Pony deck and deal 7 cards to each player. Shuffle the Ship deck. Decide which player will be the judge first. 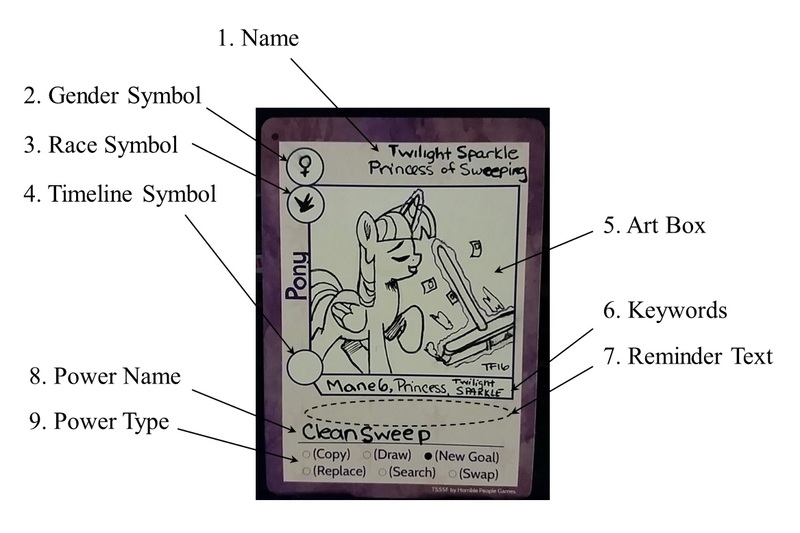 The judge reveals the top card of the Ship deck, then plays a Pony from their hand to the left or right of the Ship card to indicate that the action portrayed by the Ship card is being done by that Pony or to that Pony, respectively. For example, in the image below, Cult Leader Fluttershy is introducing her friend. If she had been played on the right side instead, she would be the one being introduced. Then, each other player submits the Pony they think best completes the ship face-down. The judge shuffles the submissions and then reveals them. The judge chooses the winner, and that player gets the Ship card. The first player to get 5 Ship cards wins. For playtesting single cards, simply playing the game and observing the how the card interacts with others may be sufficient. However, for cards that have broader influence (especially Start cards), and for entire expansions, the effect these have on the game may not be easy to determine from casual play. For this reason, I developed this sheet as a structured, numerical approach to note-taking to make comparisons easier (*.ods version). Build: List all the cards you are playing with, including the Start card. House Rules: List any rules you are using in addition to the official rules (1 activation per turn, mulligans, alternate number of active Goals, etc). Date: Record the date the game is played on. No (Number): If you play multiple games in one day, indicate which game this is (1st, 2 of 3, etc). Initial Goals: List the point value of each active Goal at the start of the game. Hand: Record the number of cards in the player's hand at the start of their turn. Draw: Keep a tally of the number of cards drawn by the player, even if those cards were immediately discarded. Make a note if a power besides (Draw) was used. Srch (Search): Keep a tally of the number of cards taken from the discard pile by the player, even if those cards were put back. Make a note if a power besides (Search) was used. End: Record the number of cards in the player's hand at the end of their turn, before redrawing/discarding to 7 total. Used: Calculate the number of cards that passed through the player's hand during their turn (not the same thing as the number of cards played, but accounts for draw 3/discard 2 and similar abilities). Used = Hand + Draw + Search - End. This formula is built into the spreadsheet. Grid: Record the number of cards on the grid at the end of the player's turn (don't count the Start card). If a large number of cards would be discarded, make a note of the number before discarding. Disc (Discard): Record the number of cards in the discard pile the end of the player's turn. If a large number of cards would be discarded, make a note of the number before discarding. Note: It is possible to double-check the numbers recorded for each player’s turn by comparing the sum of the grid and discard pile at the end of the previous player’s turn to that of the current player’s turn. Simply put: grid_prev + disc_prev + used - search - exile = grid + disc. This formula is built into the spreadsheet (except for exile because it happens so rarely that it wasn’t worth building in). Returning a card to the deck also counts as exile for the purposes of this equation. This equation hold true unless cards are exchanged between the discard pile and the deck, such as through reshuffling or Mahou Shoujo Derpy. Make a note of the number of cards in the discard pile before this happens. Won: List the point value of each Goal the player won during their turn. Replaced: List the point value of each Goal the player replaced during their turn. Make a note if a power besides (New Goal) was used. Duds: List the point value of each Goal that was revealed, but was discarded because its requirements were already met. Notes: note anything interesting that happened during the player's turn, such as combos, explanations of the player’s choices, and the appearance of powerful cards (especially Love Poisons). Score: Record each player's final score. Goals: Record the total number of Goals revealed (achieved + active + discarded) during the game. List the number of each point value. 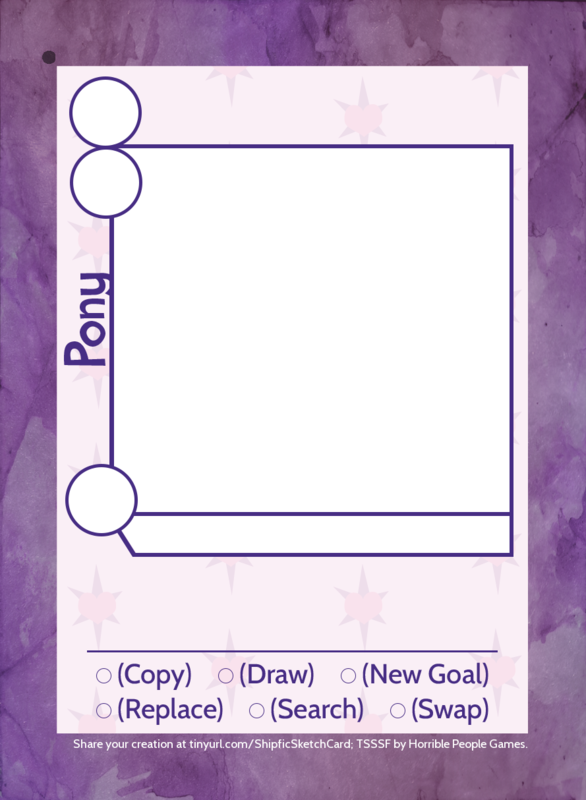 Pony: Record the number of Pony cards that players went through in the course of the game (hands + grid + discard + exile; this isn’t the exact number, but it’s close enough). If the discard pile was reshuffled, add that number as well. Ship: Same as above, but for Ship cards. There is much I hope to learn with data collected using this sheet. I would like determine what a typical game with Core deck looks like, and how it changes depending on the number of players. I would like to determine the effects of adding each of the official expansions to Core deck, and what happens when they are all played at once. I would like to determine what the ideal expansion looks like (if there is such a thing), and use it as a benchmark for designing other expansions. I wonder if there is a direct correlation between cards used and Goal point-value, and if it can be determined with the data collect using this sheet. Also, it may be possible to evaluate different play strategies using this sheet (win one Goal at a time, win as many as you can, replace the small Goals vs the big ones, play your whole hand, play as little as possible, etc). Please try this sheet out with your own games and let me know how useful it is. Please suggest changes, or make your own version of the sheet and post that. And most of all, please post your results! I don’t have a way to sort or organize them, so just link them in this thread. I've had this idea for quite a while now, and it's great to finally share it with you all! Thanks again to Egophiliac (http://egophiliac.deviantart.com/) for letting me use her character and making this amazing artwork! 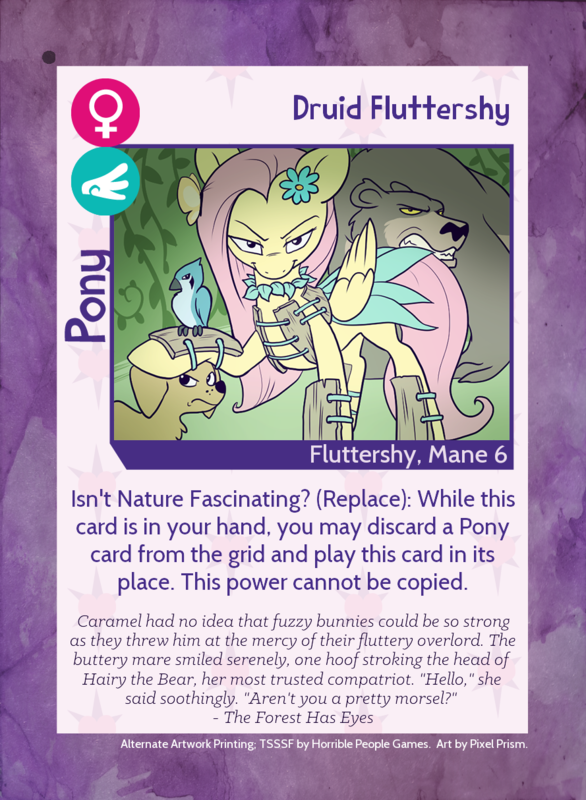 If you want a physical copy of this card, come find me (@N_A_Larson) at a convention! Also, you're welcome to print your own for non-commercial purposes. If you don't play with a lot of OCs, try this version instead. This topic has been moved to Showcase. Hey all! I'm going to PonyCon NYC and one of my goals is to get some original Shipfic promos. I'm looking for Maud Pie, Sunset Shimmer, Cider Matron Apple Bloom, and Test Subject Cheerilee. Also I would be interested in the BronyCAN exclusives and fandom cards as well. For trades, I have the 2015 promos, every mini X-Pac, the Long Box (and box promo), and some other cards as well. Maybe we can make a deal!